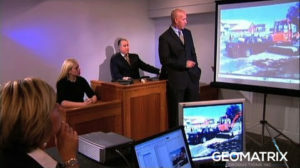 Multimedia technology has revolutionized the way evidence is presented to judges and juries in the courtroom. But navigating this new landscape of digital trials can be confusing and cumbersome for litigators seeking to win the greatest settlements for their clients. 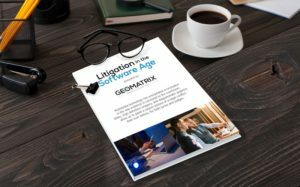 Now, Geomatrix Productions has made this task much easier with the publication of our new white paper, “Litigation in the Software Age”, a comprehensive guide to using tech at trial. With decades of experience in digital trial consultation, preparation and execution, Geomatrix has amassed trusted and proven information that will help you paint a much clearer picture of your case in the most professional way possible. 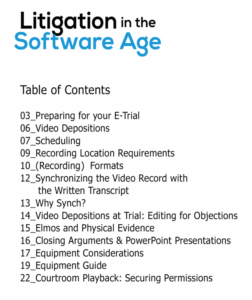 “Litigation in the Software Age” includes details on the process and procedures you will need to conduct a seamless and successful digital presentation, beginning with your selection of a production company and trial technician. It is clearly broken down into easy to understand sections including Preparing for Your E-Trial, Video Depositions, Recording Formats, Synchronizing the Video Record with the Written Transcript, Video Depositions at the Trial: Editing for Objections, the Elmo Document Camera and Physical Evidence, Closing Arguments and PowerPoint Presentations, as well as an equipment guide and tips on securing permission for courtroom playback. We encourage you to download this white paper and share it with your colleagues. The time you invest to read and consult this valuable resource could make all the difference in the outcome of your digital trials. To learn more about video technology, contact Geomatrix Productions (203.389.0001). We lead the field in the design and execution of affordable, comprehensive settlement programs while continuing to provide premier legal video production and electronic trial presentation services.